Liner wrinkles are part of owning a vinyl liner pool. A liner is very thin, and when it’s initially installed, it’s not uncommon to have some wrinkles in the pool. Wrinkles can also develop slowly over time, which is unfortunately true for both pools and people. Wrinkles are separate from divots, dents, and bumps that can also form under vinyl liners, but the issues could occur together. Liner wrinkles don’t usually cause serious problems, but they can be difficult to remove. Your best option is to catch them as the pool is being filled and keep your pool water in good condition—but if they do show up later, we’re here to help you clear them up. Wrinkles can show up for a variety of reasons. The most common reason is heavy rainfall or otherwise excessive water in the soil around the pool. Having a high water table can cause the liner to lift from the floor of the pool like a balloon. When the groundwater recedes, the liner doesn’t go back to the same position as before, so wrinkles develop. If you contract reputable builders to construct your pool, you should operate under the assumption that they want to provide you a good experience and a quality product. You’re both working toward the same goal. They don’t benefit from an upset customer. Assume the best of them and know what you need to contribute to make this project a success. If you read your warranty carefully, you'll almost certainly find that wrinkes are not covered. In this case, if the builder does install your liner incorrectly and you find wrinkles, they will not be obligated to remove them, although they should. When filling the pool, it's okay to monitor the liner for wrinkles and point them out to the builder. They may not appreciate this, but better safe than sorry. If a builder ever instructs you to remove wrinkles in a pool they are installing, you've likely picked the wrong company. Consequently, you may want to ask if this is standard practice before signing an agreement. When the builder presents paperwork for you to sign off on the liner installation, read the paperwork, discuss it, and know that you’re satisfied with the job before you sign off on it. To prevent high groundwater, install a dewatering system around the pool. You can do this both during and after construction. Maintain your water chemistry. You may be able to avoid wrinkles in addition to scaling, cloudy water, eye and skin irritation, faded and thinned liner, calcium deposits, algae...Look, you could probably solve poverty. Just take the time to test your pool water every week and adjust as needed. One temporary solution that may help with small wrinkles is to use a toilet plunger. (I suggest a new, clean one. Just in case.) This is time-consuming but less expensive than a full drain and refill. Carefully press the plunger beside the wrinkle. Gently pull the plunger up and in the direction you want the extra folded liner to go. Flatten out any residual wrinkle. For large wrinkles, you’ll definitely need to remove water from the pool. Drain the pool until there is between one and four inches of water on the liner. Pull the liner to the sides of the pool, which pulls the floor of the liner tight. Caution: after a vinyl liner has been installed for three or more years, it rapidly shrinks and becomes brittle once water is removed. We’ve seen cases where people have drained a pool to remove wrinkles and the liner split and became so brittle you could crack it like glass. If you’re going to attempt to remove wrinkles from an older vinyl liner, we suggest doing it very quickly at temperatures above 70°F (21°C). The warm temperature helps soften the liner. Drain the water, get the wrinkles out, and refill the pool as quickly as possible. Liners need to be replaced every 5–9 years, so if yours is getting old, it may be more time- and cost-efficient to replace the whole liner. 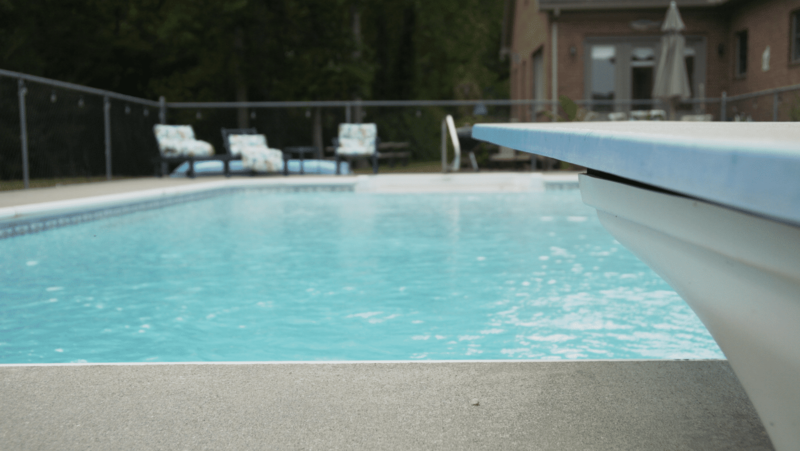 If you’re in the market for a new inground pool and the idea of fighting wrinkles and other liner issues sounds like more trouble than it’s worth, maybe you should consider a fiberglass pool as an alternative. Fiberglass pool shells are incredibly durable, look great, and have no liner to maintain. If you’d like to learn more, our ebook provides an in-depth comparison of fiberglass, vinyl liner, and concrete pools.